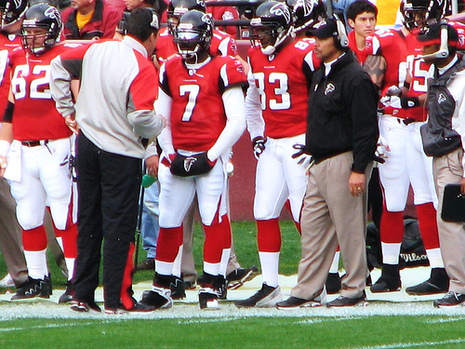 Vick was selected in the 2001 NFL Draft as the first overall draft pick and was the first African American quarterback ever taken number 1 in the NFL Draft. 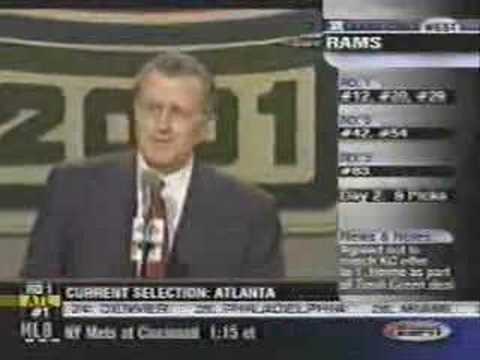 The San Diego Chargers had the number one selection spot in the draft that year but traded the rights to the first overall choice to the Atlanta Falcons a day before the draft, for which they received the Falcons' first round pick (5th overall) and third round pick in 2001 (used to draft CB Tay Cody), a second round pick in 2002 (used to draft WR Reche Caldwell) and WR/KR Tim Dwight. With the Chargers' downgraded spot (the 5th overall), they selected Texas Christian University running back LaDainian Tomlinson, who went on to become league MVP in 2006 (although Vick has never become league MVP, he finished second in voting in 2004). In this way, Tomlinson and Vick are linked as having been "traded" for each other, although the transaction was actually the result of traded draft picks and contract negotiations.